If you are a Coconut Creek business owner who wants the best in data cabling, you need look no further. 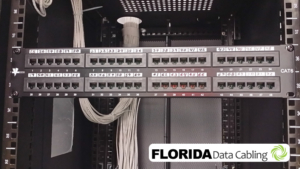 Florida Data Cabling has built an outstanding reputation on providing South Florida businesses with the best structured cabling and network wiring in the area. We understand that your business needs to have network services that are both reliable and secure if it is going to successfully compete in this competitive business market. We want to be your network cabling partner. Our mission is to help your business do more than just survive. We want to help your business thrive. Our track record in helping South Florida businesses speaks for itself. We have successfully worked on hundreds of jobs for a number of South Florida businesses, including those in centers of commerce such as Fort Lauderdale, West Palm Beach, and Miami. Our data cabling installers can design, install, and test a variety of cabling projects. We have worked with large companies in Coconut Creek as well as with many medium and small businesses. Regardless of the circumstances, we have an impressive track record for designing and installing scalable structured cabling solutions that work for our clients. We are excited to use our training and skill to help you. Whether your business needs Cat3, Cat5e, or Cat6 data cabling, we have the solution for you. Do you want to replace or improve your data wiring, your phone wiring, or your phone cabling? We can help. We guarantee the quality of our work and know that you are going to be satisfied with what we do. We are highly trained and experienced. We manage projects for offices in a variety of sectors. We have worked with call centers, IT companies, centers of education, as well as centers of manufacturing and industry. On every occasion our customers have been pleased with our work and the value it has brought to their business. We do more than simply install network cabling. If your existing network wiring or structured cabling has problems, call Florida Data Cabling. Our technicians understand complex network cabling systems. We can quickly find and fix frustrating problems. Our mission is to get your business up and running as quickly as possible. Let us focus on your network cabling needs. You focus on what’s important to you, keeping your business running smoothly. Over the years, South Florida businesses have come to trust us to handle their data and voice cabling needs. We invite you to see for yourself why we have such a great reputation. We promise to deliver our work on time. Our work is delivered on budget. And we will take every step necessary to minimize disruptions to your daily operations as we work at your facility. Call us today. Let us give you a free on-site estimate and show you how Florida Data Cabling can help you.